Noah has been enjoying his time at the Child Watch program at the Y. A few weeks ago, the director asked if I could come up with a few signs to share so that Noah would be understood when he signs. I’ve come up with nine basic American Sign Language signs that are commonly used at home and in the childcare setting; Mommy, Daddy, water, thirsty, all done, more, potty, ball and hurt. For many children with Down syndrome, apraxia, and other speech delay, motivation can be a real problem. There is nothing more frustrating to a child than attempting to communicate with someone who isn’t understanding them. On the flip side, there is nothing more motivating to a child struggling with speech than to have the people around him understand and respond to his attempts to communicate. Please share these signs with your child’s school, babysitter, daycare center, Sunday school class, grandparents, and anywhere else your child may be at risk for not being understood. Thanks to http://www.babysignlanguage.com for allowing me to use their graphics. It’s a joy to hear Noah answer people now when they ask him his name. It’s an opportunity for him to use his newly acquired speech skills in real-life situations, and it’s a powerful motivator for him to speak. Reading and writing his name is something Noah has been working on as well. 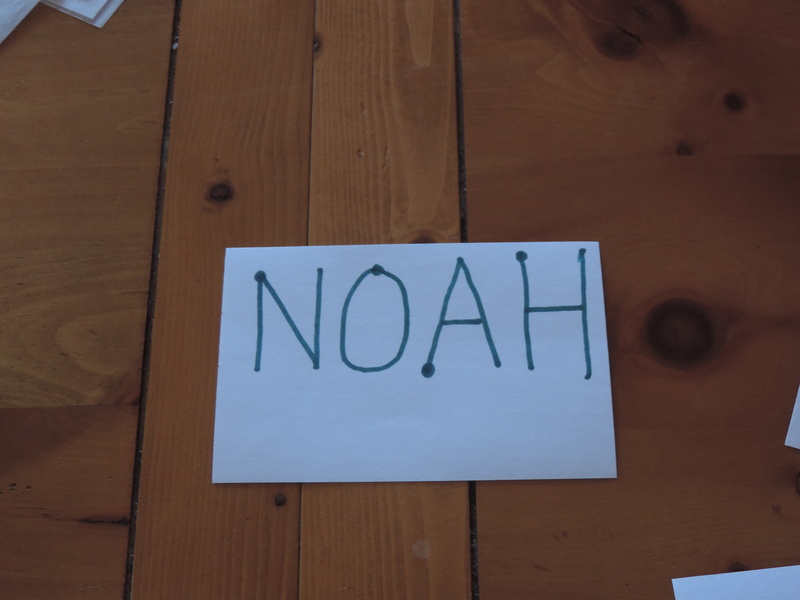 Tammy’s post here: http://www.prayingforparker.com/name-activities-for-kids-with-special-needs/ got me thinking about getting more serious about name writing for Noah (and the rest of my Littles). Well Noah’s a talented little guy, let me tell you. What I love most about this activity is that at the end, you have nothing but your child’s work on a sheet of paper. Truly, I don’t mind giving Noah whatever assistance he needs, but there’s something thrilling about seeing work that is 100% his. Several colors of crayon or thin marker (I use red, pink and blue in the script). You’ll find I maximize the speech opportunities as much as I can in this exercise. Not only does it kill two birds with one stone, it gives Noah a chance to use speech in real-life context, something that doesn’t happen in our daily drilling sessions. Write your child’s name on the index card in large capital letters. (Capital letters are easiest for children to form.) At the beginning point of each letter, place a large dot. 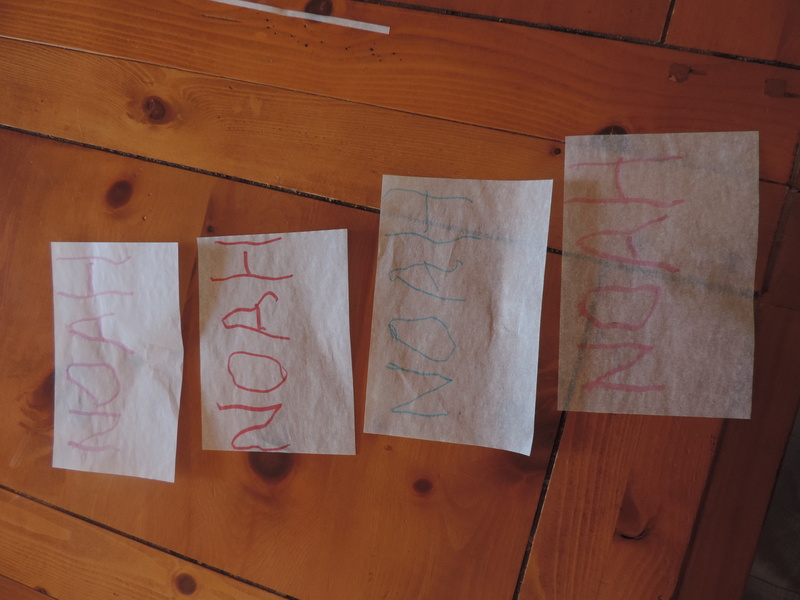 Use double-sided tape to tape one sheet of tracing paper over your child’s name. Show your child the card and say, “Noah. 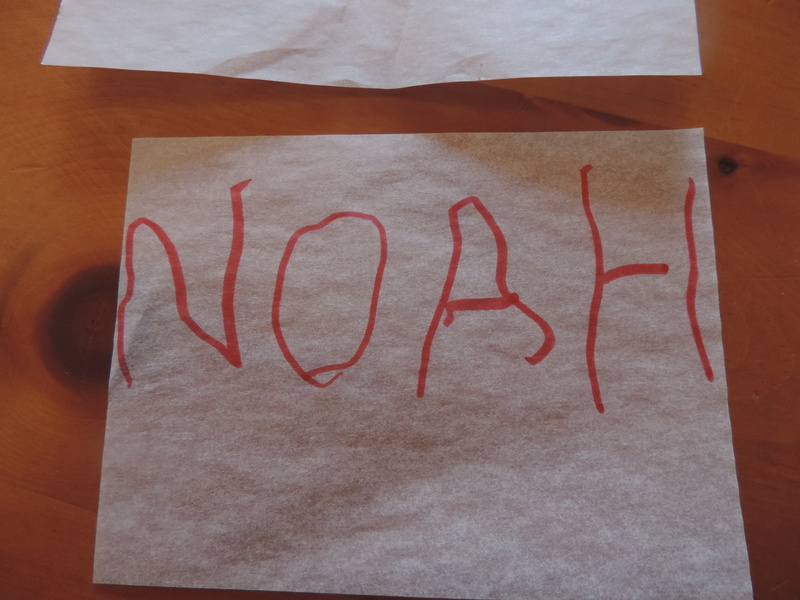 This says Noah.” Prompt child to say Noah. Point to the first letter. “N.” (Prompt child to say N). Repeat letter naming starting with pointing to the letter for each letter of the name. Start back at Step 2 for two more tracings. This is a great way to encourage real-life speech, color recognition, name recognition and writing all in one fun exercise. Let me know how it goes! ***If the writing portion of this exercise really taxes your child and prompted speech instruction also taxes your child, do not insist on the speech production portion of this exercise. Your child may need to use all his available resources to do one or the other for the time being. Work on integrating the two as he progresses in his abilities. In hopes of working in some additional sounds, I was eager to leap to peekaboo. That’s how I came across this classic children’s book. So many language concepts and so many opportunities for extension activities in this adorable picture book! The first page shows the child looking at a clue (the puppy’s tail) and saying “Peek-a-Boo I see . . .” Turn the page to find the item the child was in pursuit of along with text that names the item: My mommy, my daddy, me, my puppy, my train, my grandma, my grandpa, a bunny, a butterfly, my friend, and you. American Sign Language: All these phrases Noah just happens to know in American Sign Language (ASL), so we were able to sign the entire book. 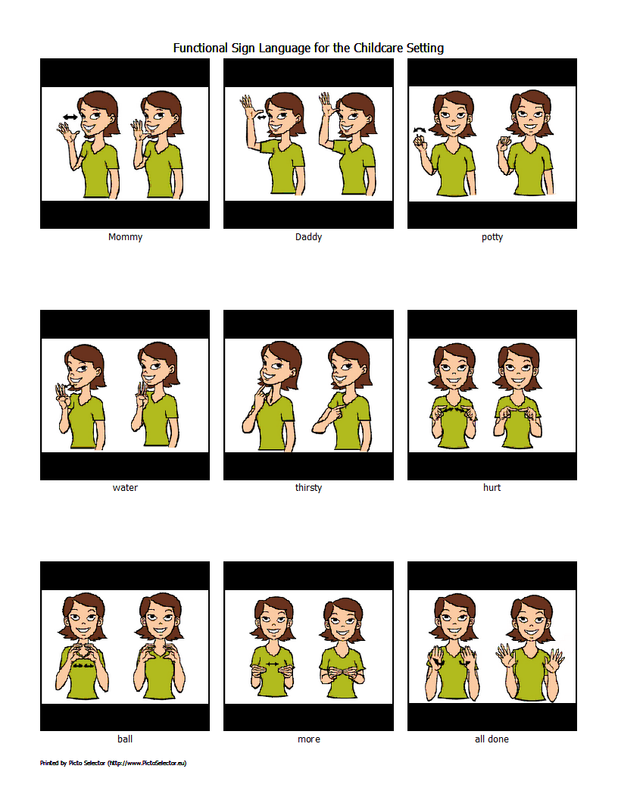 Click below for ASL printable flashcards for family names. The graphics are from www.babysignlanguage.com. And for the other words in Peekab00 Morning in ASL, click here: Peekaboo Morning ASL. If you are not familiar with these signs, you will want to use a free ASL site with video clips like www.lifeprint..com or www.aslpro.com to learn the sign and just use the flashcards as prompts or reminders. Target Words: My, mommy, daddy, me, puppy, train (choo choo), and bunny are all words Noah can say. We used reading this story as articulation practice by me reading the words and pausing before the words associated with the pictures. Noah takes those cues well and will usually say the target word as I point to the picture. Depending on the mood he is in, I will often then repeat it back to him and wait for him to say it again two more times, refining his articulation as needed. I cut, laminated and stuck a magnet on the back of these. Same idea as using Velcro for a PEC story board – just spicing it up a bit. As we read the book, Noah finds the PEC that matches the object on the page and places it in order on a metal cookie sheet, refrigerator or (metal) door. Predictable Language: This is my favorite aspect of this adorable book. On most of the “Peek-a-boo, I see . . .” pages, there is a small visual clue as to what will be on the next page, a puppy’s tail, a grandma’s hat, a newspaper hiding a grandpa, etc. By drawing your child’s attention to that small detail, he can very excitedly guess what will be on the next page. Noah loved this, although he started signing butterfly halfway through the book, knowing it would be coming up soon. I love that he was so excited about what he knew was coming. His love of books is so encouraging to me! Extension Activity: Make your own Peekaboo Morning book based on your child’s target words using photographs. Take pictures of his favorite people and things, and create pages with text that read “Peek-a-Boo, I see . . .” alternating with the pictures of the object and appropriate text labeling. This is a fun way for parents to make books about family life as well as for teachers and therapists to make books about friends. activities, and teachers at school. For other language-rich picture book ideas for speech therapy, please visit my Language-Rich Picture Books and Extension Ideas page at https://wordsofhisheart.wordpress.com/wp-admin/post.php?post=2647&action=edit.